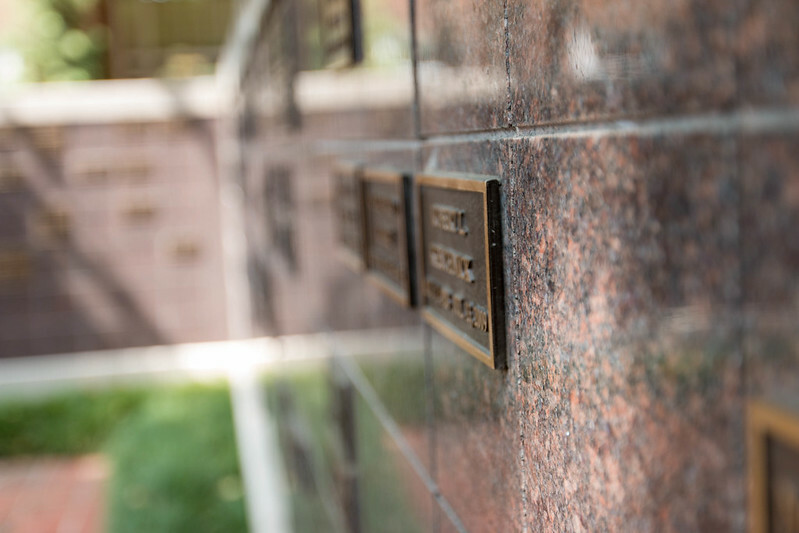 Our columbarium allows our members and their families the opportunity to have their final resting place within the shadow of the church that has been a central part of their lives. This sacred site of beauty and dignity is a place where loved ones can visit and meditate any time. The columbarium eliminates the pressures of choosing a burial site, casket, vault, and monument. Planning the interment and memorial services is also much simpler since it can all be at one location. The costs of cremation and a niche in the columbarium are significantly less than the costs of a casket, burial site, and marker. Niche assignments are allocated in accordance with the desires of each applicant on a first-come, first-served basis. A niche can contain two urns. Click here for the application for the Columbarium. Return completed applications to the address listed on the application form. Once the application is approved, a certificate covering inurnment ownership rights will be sent to the purchaser. If you purchase a niche and decide not to use it, we will repurchase the niche for the original selling price. Once the niche has been used, no refund will be made. A niche cannot be sold or transferred and may only be used by those listed in the original purchase. The fee for a niche is $1,500. This fee includes two urns, the plaques inscribed with name and dates of birth and death, the opening and closing of the niche for inurnment, and perpetual care. Each niche is designed to hold two urns. This fee does not cover the cost of cremation. For more information, please contact Debbie Tunnell at or 214-695-2714. One of the most loving gifts you can leave your family is having already arranged for your memorial service and cremation. Any one of our ministers is happy to assist you in planning your memorial service and will keep your wishes on file at the church. Choosing a funeral home for cremation need not be a difficult task. To assist you, click below to see a sampling of funeral homes offering cremation services with their prices.